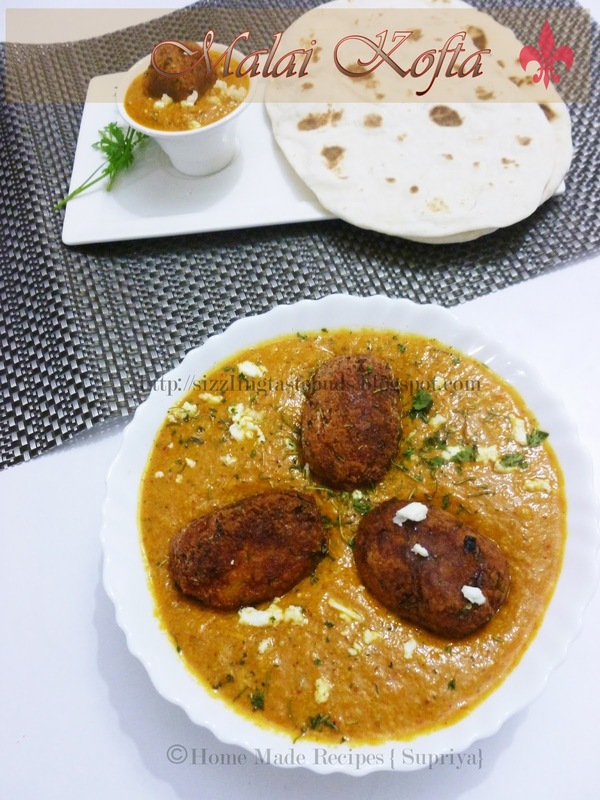 Malai Kofta is a rich, creamy dish with potatoes, paneer, cashew paste and Malai (Fresh cream ). It goes very well with Indian flatbread like Naan, Kulchas or even with hot rice. This month's SNC event gave me a chance to try this out and the result was awesome , finger-licking good , rich Mughlai dish with hot Indian flatbread Naan for lunch. Thanks to SNC for this event and Nupur for this delicious dish. To know more about SNC event, click here.I prepared this with plain Naan. (Recipe will follow soon). Now lets head direct to the recipe. 1. Mix all the ingredients mentioned under Kofta list in a mixing bowl and make appx 10 medium sized balls and keep aside. 2. Heat oil in a wok for shallow frying or deep frying the koftas. Method I used here is shallow frying. Coat the koftas with corn flour and fry them till golden brown. Remove them when done on a kitchen towel and keep aside. Koftas are ready. 3. Take another pan or wok and add 2- 3 tsp of oil. When the oil gets heated up, add in the whole spices mentioned in the ingredients and fry for few secs. 4. Add onion and saute it till they turn light brown in colour. Add in ginger- garlic paste and saute it for a minute. Switch off the flame and allow this to cool down and then make a paste of this in a blender along with soaked cashewnuts. Keep aside. 5. Switch on the flame again and add the onion and spice paste, tomato puree and mix it. When the mixture comes to a boil add in haldi, red chilli powder and garam masala powder. Mix well and cook it in a low flame till oil starts to leave the sides. Add water if needed depending on your required gravy consistency. 6. Now add fresh cream (malai ) or milk. Simmer for another 4-5 minutes. 7. Add Salt to taste and crushed kasuri methi. Mix well and switch off the flame. Gravy is ready. Transfer the gravy to the serving bowl and arrange the koftas on top of it. Garnish with grated paneer, chopped coriander leaves or fresh cream. Milk/cream should be at room temperature before adding to the gravy or it might curdle. 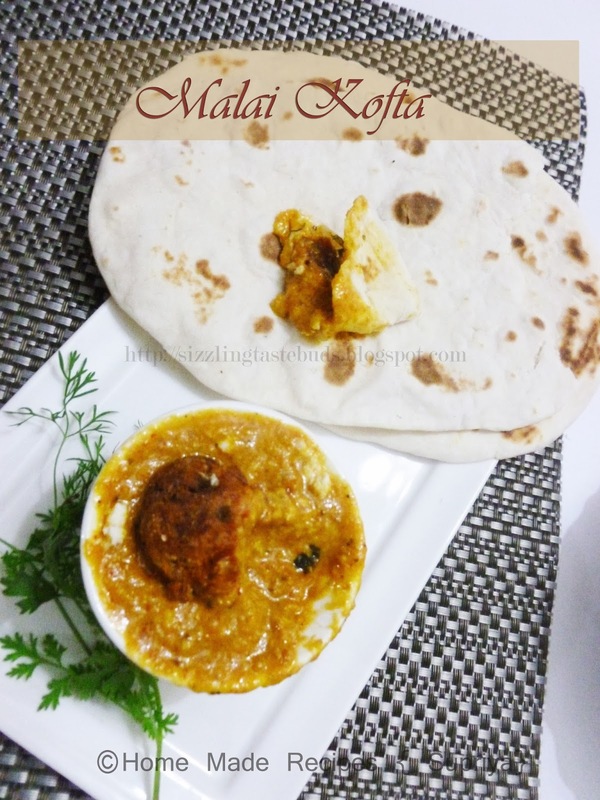 Looks super yum....I've made malai kofta only once for a potluck...got to try ti again. 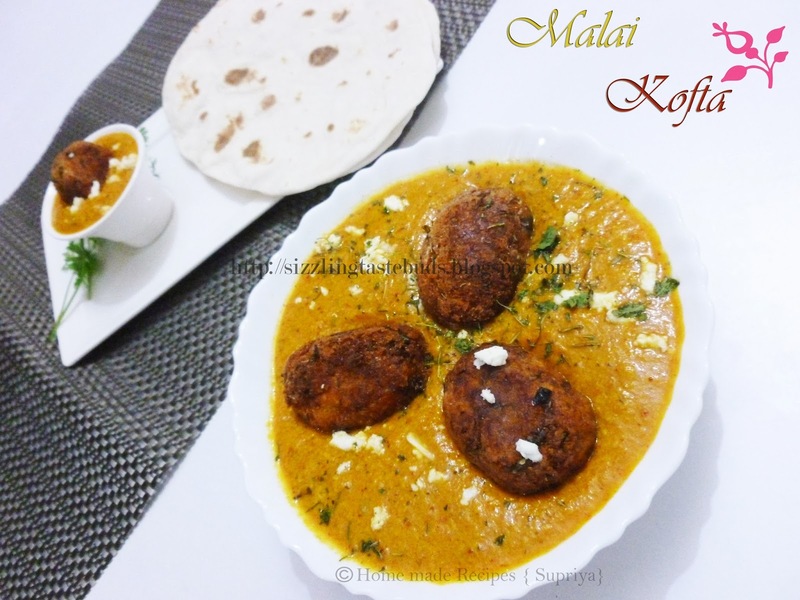 wow mouthwatering luscious malai kofta :) looks yum yumm ! !